Trotskyism is the theory of Marxism as advocated by Leon Trotsky. Trotsky identified himself as an orthodox Marxist and Bolshevik-Leninist, and supported founding a vanguard party of the proletariat, proletarian internationalism, and a dictatorship of the proletariat based on working class self-emancipation and mass democracy. Trotskyists are critical of Stalinism, as they oppose the idea of Socialism in One Country. Trotskyists also criticize the bureaucracy that developed in the USSR under Stalin. On the political spectrum of Marxism, Trotskyists are usually considered to be toward the left. In the 1920s they called themselves the Left Opposition, although today's left communism is distinct and usually non-Bolshevik. The terminological disagreement can be confusing because different versions of a left-right political spectrum are used. Anti-revisionists consider themselves the ultimate leftists on a spectrum from communism on the left to imperialist capitalism on the right. But given that Stalinism is often labeled rightist within the communist spectrum and left communism leftist, Anti-revisionists' idea of left is very different from that of left communism. 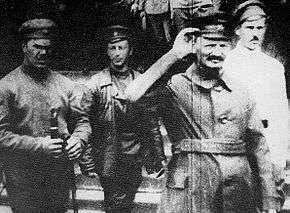 Trotsky and Stalin, despite being Bolshevik-Leninist comrades during the Russian Revolution and Russian Civil War, became enemies in the 1920s and thereafter opposed the legitimacy of each other's forms of Leninism. In Results and Prospects, written in 1906, Trotsky outlines his theory in detail, arguing: "History does not repeat itself. However much one may compare the Russian Revolution with the Great French Revolution, the former can never be transformed into a repetition of the latter." In the French Revolution of 1789, France experienced what Marxists called a "bourgeois-democratic revolution"—a regime was established wherein the bourgeoisie overthrew the existing French feudalistic system. The bourgeoisie then moved towards establishing a regime of democratic parliamentary institutions. However, while democratic rights were extended to the bourgeoisie, they were not generally extended to a universal franchise. The freedom for workers to organize unions or to strike was not achieved without considerable struggle. According to Trotsky, the term "Trotskyism" was coined by Pavel Milyukov, (sometimes transliterated as Paul Miliukoff), the ideological leader of the Constitutional Democratic Party (Kadets) in Russia. Milyukov waged a bitter war against Trotskyism "as early as 1905". In The Stalin School of Falsification, Trotsky argues that what he calls the "legend of Trotskyism" was formulated by Grigory Zinoviev and Lev Kamenev in collaboration with Stalin in 1924, in response to the criticisms Trotsky raised of Politburo policy. Orlando Figes argues: "The urge to silence Trotsky, and all criticism of the Politburo, was in itself a crucial factor in Stalin's rise to power." 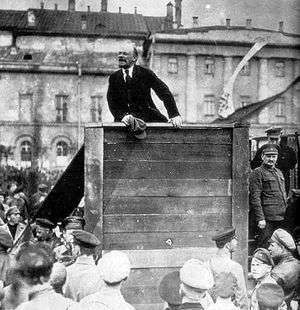 During 1922–24, Lenin suffered a series of strokes and became increasingly incapacitated. Before his death in 1924, Lenin, while describing Trotsky as "distinguished not only by his exceptional abilities—personally he is, to be sure, the most able man in the present Central Committee", and also maintaining that "his non-Bolshevik past should not be held against him", criticized him for "showing excessive preoccupation with the purely administrative side of the work", and also requested that Stalin be removed from his position of General Secretary, but his notes remained suppressed until 1956. 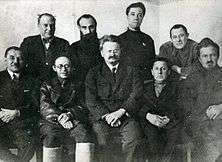 Zinoviev and Kamenev broke with Stalin in 1925 and joined Trotsky in 1926 in what was known as the United Opposition. The Fourth International split in 1953 into two public factions. 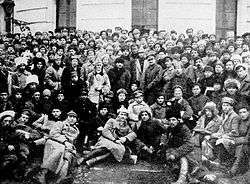 The International Committee of the Fourth International (ICFI) was established by several sections of the International as an alternative centre to the International Secretariat, in which they felt a revisionist faction led by Michel Pablo had taken power, and recommitted themselves to the Lenin-Trotsky Theory of the Party and Trotsky's theory of Permanent Revolution. From 1960, led by the US Socialist Workers Party, a number of ICFI sections began the reunification process with the IS, but factions split off and continued their commitment to the ICFI. Today, national parties committed to the ICFI call themselves the Socialist Equality Party. In Brazil, as an officially recognised platform or faction of the PT until 1992, the Trotskyist Movimento Convergência Socialista (CS), which founded the United Socialist Workers' Party (PSTU) in 1994, saw a number of its members elected to national, state and local legislative bodies during the 1980s. The Socialism and Liberty Party (PSOL) presidential candidate in the 2006 general elections, Heloísa Helena is termed a Trotskyist who was a member of the Workers Party of Brazil (PT), a legislative deputy in Alagoas and in 1999 was elected to the Federal Senate. Expelled from the PT in December 2003, she helped found PSOL, in which various Trotskyist groups play a prominent role. In 1964 a section of the LSSP split to form the LSSP (Revolutionary) and joined the Fourth International after the LSSP proper was expelled. The LSSP (R) later split into factions led by Bala Tampoe and Edmund Samarakkody. The LSSP joined the "coalition" government of Sirimavo Bandaranaike, where three of its members, NM Perera, Cholmondely Goonewardena and Anil Moonesinghe were brought into the new cabinet. The Fourth International derives from the 1963 reunification of the two public factions into which Fourth International split in 1953: the International Secretariat of the Fourth International (ISFI) and some sections of the International Committee of the Fourth International (ICFI). It is often referred to as the United Secretariat of the Fourth International, the name of its leading committee before 2003. The USFI retains sections and sympathizing organizations in over 50 countries, including the Ligue Communiste Revolutionnaire of France, as well as sections in Portugal, Sri Lanka, the Philippines, and Pakistan. The International Committee of the Fourth International maintains its independent organization, and publishes the World Socialist Web Site. The Committee for a Workers' International (CWI) was founded in 1974 and now has sections in over 35 countries. Before 1997, most organisations affiliated to the CWI sought to build an entrist Marxist wing within the large social democratic parties. The CWI has adopted a range of tactics, including working with trade unions, but in some cases working within or supporting other parties, in 2016 endorsing Bernie Sanders for the US Democratic Party nomination, and encouraging him to run independently. Polish philosopher Leszek Kołakowski wrote that "Both Trotsky and Bukharin were emphatic in their assurances that forced labour was an organic part of the new society." In the United States Dwight Macdonald broke with Trotsky and left the Trotskyist Socialist Workers Party, by raising the question of the Kronstadt rebellion, which Trotsky as leader of the Soviet Red Army and the other Bolsheviks had brutally repressed. He then moved towards democratic socialism and anarchism. A similar critique on Trotsky's role on the events around the Kronstadt rebellion was raised by the American anarchist Emma Goldman. In her essay "Trotsky Protests Too Much" she says "I admit, the dictatorship under Stalin's rule has become monstrous. That does not, however, lessen the guilt of Leon Trotsky as one of the actors in the revolutionary drama of which Kronstadt was one of the bloodiest scenes." ↑ Trotsky, Leon, Results and Prospects, p 204–5, New Park publications (1962). Trotsky adds that the revolution must raise the cultural and political consciousness of the peasantry. ↑ Marx, Karl; Engels, Friedrich (March 1850). "Address of the Central Committee to the Communist League". Marxist Internet Archive. Retrieved June 6, 2016. ↑ This summary of Trotsky's role in 1917, written by Stalin for Pravda, November 6, 1918, was quoted in Stalin's book The October Revolution issued in 1934, but it was expunged in Stalin's Works released in 1949. ↑ Lenin, Report on the substitution of a tax in kind for the surplus-grain appropriation system, Tenth Congress, March 15, 1921, Collected works, Vol 32, p215. This speech, of course, introduced the New Economic Policy (NEP), which was intended to reinforce the basis of the second of the two conditions Lenin mentions in the quote, the support of the peasantry for the workers' state. ↑ Lenin, Collected works, Vol 36, pp593–98: "Stalin is too rude and this defect [...] becomes intolerable in a Secretary-General. That is why I suggest that the comrades think about a way of removing Stalin from that post [...] it is a detail which can assume decisive importance." ↑ Rogovin, Vadim, 1937: Stalin's Year of Terror Mehring Books, 1998, p374. Also see the chapter 'Trotskyists in the camps': "A new, young generation of Trotskyists had grown up in the Soviet Union...lots of them go to their deaths crying 'Long live Trotsky!' " Until this research became available after the fall of the Soviet Union, little was known about the strength of the Trotskyists within the Soviet Union. ↑ "The USSR and Stalinism". Marxist Internet Archive. December 1948 – January 1949. Retrieved June 6, 2016. ↑ Cannon, James P. "The Revolutionary Party & Its Role in the Struggle for Socialism". Marxists.org. ↑ North, David (2008). The Heritage We Defend. Mehring Books. pp. Sections 131–140. ISBN 978-0-929087-00-9. ↑ Declaración PolÃtica de la JIR, como Fracción Pública del PRS, por una real independencia de clase (Extractos) - Juventud de Izquierda Revolucionaria. Replay.web.archive.org. Retrieved on 2013-07-26. ↑ Ervin, W E, Tomorrow is Ours: The Trotskyist Movement in India and Ceylon, 1935-48, Colombo, Social Scientists Association, 2006. ↑ BBC 'On this day' retrospective is "1990: One in five yet to pay poll tax"
↑ . Diário da República, 1ª série — Nº 205 (2015-10-20). Retrieved on 2016-05-18. ↑ "Fourth International". International Viewpoint. 5 August 2016. ↑ Olgin, Moissaye J. 1935. Trotskyism: Counter-Revolution in Disguise. New York: Workers Library Publishers. Chapter Fourteen. ↑ Haywood, Harry. 1978. Black Bolshevik: Autobiography of an Afro-American Communist. Chicago: Liberator Press. Chapter Six. ↑ Memoirs of a Revolutionist: Essays in Political Criticism (1960). This was later republished with the title Politics Past. ↑ Emma Goldman: "Trotsky Protests Too Much"